Wolves - Another 10th Amendment Issue? Further explained this means that anything not specifically made a federal power or responsibility legally belongs to the individual states to own, operate, manage, or regulate as appropriate. 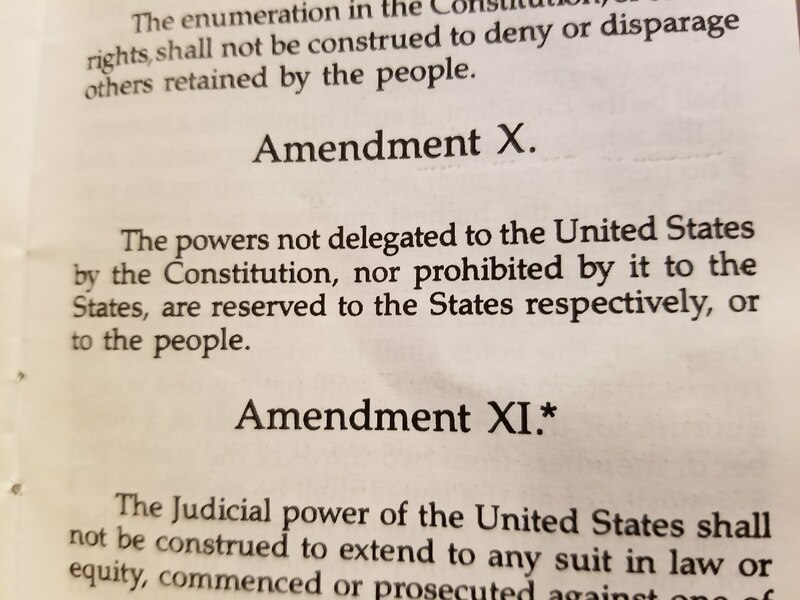 The 10th Amendment, part of The Bill of Rights to the US Constitution, was written to assure the citizens that power not granted to the federal government would not be grabbed by the federal government but rather left to the states or the people. It does not specify what some of these powers might be. It was ratified on December 15, 1791. One big issue often discussed when talking states’ rights is public education as there is nothing in the Constitution making public education a federal responsibility. Yet, look at the involvement of the federal government in education today and for many decades in the past! While the Obama Administration wanted to deflect the origin of “Common Core” to the Governors’ Association, they nevertheless tied federal funding for education to the acceptance of “Common Core” thus indirectly mandating its widespread acceptance and concurrently not allowing individual states’ initiatives. Wolves were previously on the endangered species list and then removed by the Obama Administration about six years ago. Wisconsin, with all the authority of the 10th Amendment, then managed the wolf population, had a successful wolf hunting season for three years, and had what appeared to be a healthy wolf management plan in place. Then, in 2014, a federal judge ordered the wolves be placed back on the endangered species list and today, as the four legislators have said, wolves have taken over northern Wisconsin. The four legislators involved together represent most of northern Wisconsin –from the Upper Peninsula of Michigan to the St. Croix River bordering Minnesota. The number of wolves in Wisconsin, and the number of wolf packs, is growing at an alarming rate. Wisconsin’s Department of Natural Resources confirmed 76 wolf attack incidents in 2016. The proposed bill would become null and void if the Trump Administration removes the wolves from the endangered species list. A late November editorial in The Country Today newspaper made a good point with the title “Action needed on wolf issue sooner rather than later”. And, that action is simply let the states, rather than the federal government, manage the wolf population. Isn’t this what the 10th Amendment is all about?